The third film in the Bill & Ted series, titled Bill & Ted Face the Music, has been set for an Aug. 21, 2020, release by MGM’s Orion Pictures label. 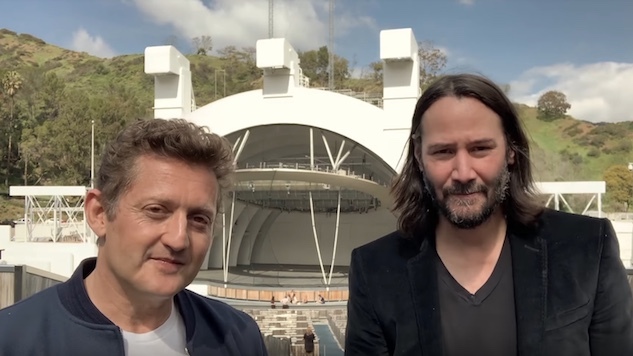 The news came in an announcement video on Orion’s YouTube channel Wednesday morning, with stars Alex Winter and Keanu Reeves standing in front of the Hollywood Bowl and thanking fans for their continued support over the years. The Bill & Ted franchise began way back in 1989 with Bill & Ted’s Excellent Adventure, a sci-fi comedy about two lovable numbskulls from San Dimas, Calif., who travel back in time and recruit various historical figures for their high school history presentation. Winter plays William “Bill” S. Preston, Esq., and Reeves plays Theodore “Ted” Logan. The film was a cult success and was followed up two years later by Bill & Ted’s Bogus Journey. A third installment has been rumored to be in the works since 2010, with Winter offering a promising update in 2016, but it wasn’t officially confirmed until May 2018. Bill & Ted Face the Music was penned by Chris Matheson and Ed Solomon, the writers of the first two films. It was directed by Dean Parisot, who is perhaps best known for helming the 1999 sci-fi comedy Galaxy Quest. There are no plot details out there for the third film at the moment, but based on the title, one would assume it involves a whole lot of righteous, world-saving rock from Bill and Ted’s band, Wyld Stallyns. Check out the announcement video and synopsis for Bill & Ted Face the Music below.